The END. What do you think, everyone? Why Are Closed Room Murders So Beautiful? The bomb existence is key because it is the final outcome that always happen in all games. What happens when we take out Yasu from the picture? Why does it always happen? By working under the premises of multiple scenarios I explain what happens in each case and why the result is always the same. EPs are mentioned as possible solutions explaining how the events happen in them. They don’t necessarily have to be right because there can be other EPS that work better. All explanations before to the final game rundowns are possible scenarios of how the bomb factor is introduced in each story. They are to be taken separately because the premises are different. The different premises for each case are these: a) The culprit is Yasu who sets up the bomb. b) The culprit is someone other than Yasu who learns of the bomb, this person is the new culprit. c) There could be two culprits at the same time when the riddle isn’t solved. This is unknown. d) The bomb going off could be due to an error on the new culprit’s plan. e) By the original culprit’s plan this isn’t a mistake but the goal. Special terms I’m using them for this entry so there is no confusion. Red claims will be used before this is the main premise I’m working on and blue claim to point out that point should be highly stressed. The term “original culprit” term is applied to Yasu because she had already decided to carry out the serial murders. The term “new culprit” is applied to somebody else other than Yasu. The one who carries out the murders after finding the gold (cash card) or by his own reasons possibly not related to the gold. Yasu is genderless but I refer to Yasu as “her” because it is a hassle to use he or she. Same principle applies to the word culprit/killer which I refer to that person as “he”. For the sake of this entry I mostly refer to Yasu as “Kanon or Shannon”, therefore according to EP7’s info the one knows of the bomb is Kanon and Shannon. There’s a possibility that there could be somebody else who know of the bomb other than Yasu (Genji i.e.) This is discussed but not taken in full consideration. This is about Yasu. Note. 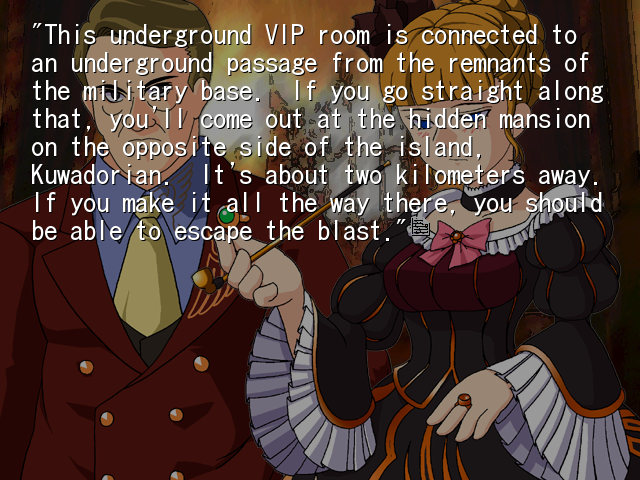 One of the details I don’t recall is how potent the bomb is and how it is depicted in past games therefore I’m going with the only future Ange’s fragment where the Rokkenjima exists and I take it, it is the mansion and its premises, what was blown up. Not2. I’ve only read EP7 once, however I’ve reread the part where they all reach the golden land. Any missing information is to be noted. The bomb is set by a mechanism (the clock) on the Golden Land, the secret room where the gold is. The bomb is set to explode when the clock reaches 24:00 of any day, the mechanism that is connected to the remaining war supplies makes the bomb goes off and the whole mansion blows up to pieces. When it is set to left it doesn’t go off and if it remains that way it shouldn’t go off. When it is set to the right it goes off when the handle reaches 24:00. In other words left would be “off” and right would be “on.” If it is “on” when the clocks reaches 24:00 the bomb goes off and everyone who is still remotely near the mansion dies. 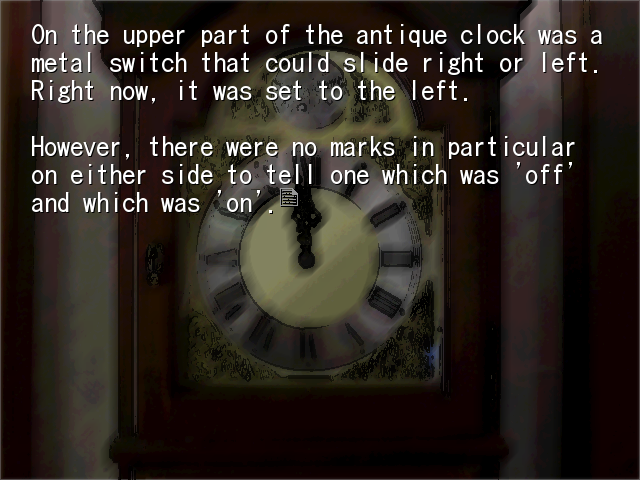 Bernkastel’s solution was that this mechanism was located in the secret room. It makes sense to believe this as that room is the hardest to reach by anyone. In addition, the fact that Kinzo forbid his children to go near the chapel backs this up. The idea here is the device would be located in the less frequented place and one that Kinzo would have accessed to the most, if not reduced to a place that only Kinzo would have access to. I can accept that. Other than the secret underground VIP room my other picks were the VIP room, the chapel, and Kinzo’s study as also possible places, but the secret room just seems like the best pick. Now this device isn’t some futuristic clock that one can program to go off, say, 365 days from October 5, 1985 and hope that it go off on that date. Kinzo armed it but when he died he was no longer able to mess directly with it anymore. Only the people who he told of the existence of the bomb would have knowledge of it. The device as I understand it must be set, and I’ll use red because I think there isn’t and there shouldn’t be any other way around it that, “It must be set by an actual person for the bomb to be set. No other tricks are allowed.” Meaning that a) there must be someone who knows of the secret room and b) there is always someone who learns of the bomb and reaches the Golden Land. Either of these two premises must happen in all games. Kinzo knew of the secret underground VIP for clear reasons and also “Beatrice” finds it after she solves the riddle and meets Kinzo afterward. We assume that it is also highly likely Genji also knew of it, therefore we cannot deny it. Other characters who may know of it could be Kumasawa, however there’s a part in EP 4 where it is mentioned that Kumasawa wanted to solve the riddle herself at some point, therefore (unless we think that was an act on her part to make others take initiative in it) I assume that she didn’t know where exactly the gold was located and was never able to find it herself, even less knew that there was a bomb there or even if she knew of it she probably assumed it was disconnected or no longer functioning. Should there be somebody else who knows of the bomb other than Yasu our guesses would be placed on Genji. At this point the following people knew of the place: Kinzo, Genji (likely), and Yasu once she finds it. There aren’t supposed to be anyone else who reaches the place before the family conference. I stress, however, that this reasoning doesn’t include Genji fulfilling Yasu’s role of explaining the device to those who reached the Golden Land. It is only possible for others to attempt to solve the epitaph once they’re on Rokkenjima and in the family conference. So far as the story tells us prior to that none of the siblings solved it, none of the cousins solved it, now not so believable the furniture didn’t solve it either, of course assuming Yasu is Shannon/Kanon it’ll mean they knew of the gold and the bomb same as in EP7. In other words Yasu is the one who knows of the place AND of the bomb. Since I don’t believe that there’s a X person in Rokkenjima and that Yasu is in reality a character in the story we assume Yasu’s identity to be Shannon, Kanon or both. By connecting Yasu to them we come to the conclusion that Shannon/Kanon has already solved the epitaph and she’s ready to carry out the serial murders and the only way to stop her is to solve the riddle. If no one does at the start of Oct 5, 1986 she’ll start killing. If no one solves it before it is Oct 6 the bomb she had set up will kill everyone including herself. The part that I take interest in is the idea that Yasu must exist in order for this secret to be known. And in the idea of what happens when this information is lost or what happens when Yasu’s intentions change. According to EP7 Yasu was already on the underground VIP room when the rest arrived. Her presence is extremely important I stress. She knew of the place already. She knew of the Bomb already. Her plan was to kill 13 people then set up the bomb so it’d detonate before it was Oct 6, 1986. It all sounds like it is part of her plan. Everything points out that this is all her and that the tragedy will happen unless someone solves the riddle. If Yasu is defeated and someone finds the Gold it is game over for her. If no one reaches the Golden Land then Yasu will proceed to murder everyone. However, the final outcome never changes because even when it is solved the tragedy still happens. – Why? Because there’s always someone carrying out the serial murders in all games. In the case the killer is Yasu – I still think that unless all the siblings put their brains together the chance of any of them finding the gold alone it is slim. The original culprit kills 13 people then the bomb kills everyone else. The culprit dies along with everyone. This is the linear path that culprit was going to take in case no one solved it. I do think that this is what happens in the 1st Game as it is the beginning of the tragedy. The culprit in the next Games is likely a different person because the role of the culprit is taken by a “new culprit” with his own agenda. The result of this game is that Yasu, the original culprit, dies along with the rest when the bomb she herself set up explodes. All of this complies with EP7 Tea party. It’s a risky move to carry out 1st-9th twilight without setting up the bomb but also doing it would be too premature for the Yasu. EP7 mentions how Yasu will carry out “13 murders” first then kill everyone with the bomb to finish it off. It never says that she wanted to blow up everyone before they had a chance to solve the riddle. Emphasis on that because for Yasu it’d be incredibly easy to just flip that switch “on” and make it go off on Oct 5 instead of Oct 6 and be done with it. That’s why I’m positive under normal conditions Yasu should only go back to the underground VIP room after the 8th twilight is completed. Whether Yasu goes back to the mansion/guesthouse and hunts down the survivors before it is 24:00 pm or just wait for the bomb is irrelevant as long as the result is the same. You’ll see why. In short, the premise that involves Yasu faking her death is the easiest to explain since she just goes back to the VIP room and flips the switch ON when the 8th twilight has been completed. There’s plenty of hours that corpses are left unsupervised and in some cases the rest never return to those rooms to check up on the bodies again. When Yasu doesn’t fake his death in the 1st twilight it means Yasu carries out the serial murders as long as no one does solve the riddle. Yasu goes back to the secret room and flips the switch on at the 8th Twilight so everyone dies as a result. Explaining why the bomb goes off despite the culprit dying could be attributed to an accomplice flipping the switch by the culprit’s orders or even though it doesn’t sound that fair, to the fact that Yasu had already flipped it before the 8th Twilight in case she was killed. Foolproof plan. EP1 can serve as an example. The riddle in EP6 is never solved either. In case Yasu is prematurely killed or isn’t present at the Golden Land – EP7 shows Yasu as the human culprit. When the gold is found Yasu is defeated and doesn’t do a thing. Yasu doesn’t take part in the end and doesn’t care what happens to her or to the others now that she’s been defeated. This applies when somebody else finds the gold and takes the place of the Witch (instead of Yasu) and carries out the serial murders. According to EP7 the motive is greed and how the “new culprit” learns of the Bomb is also mentioned. What’s wrong with this? The fact that there simply must exists someone who informs the “new culprit” of the Bomb. There must be someone who fills that role. If there isn’t that person then the explosion doesn’t connect with the culprit’s plan. It wouldn’t be part of his plan because the new culprit would lack that information. “I stress that there isn’t an easy and outright way for the new culprit to learn of the bomb unless it is properly explained to him.” Guess work wouldn’t be enough. “Wouldn’t put it past father” is possible but nothing that solid that would spell out “there are bombs (even though Rokkenjima used to be base) and there’s also a secret mechanism to make everything go boom. These little details would escape everyone because even if they’d contemplate the idea they wouldn’t know for certain or of the mechanism for that matter that those in reality existed. There’s also the idea that the new culprit could follow the passage that leads to the remains of the military base but it wouldn’t outright make the culprit connect all that information into a single theory and less that the clock was detonator unless there was clear evidence of it such as cables still lying around, which I’ll have to assume would have to necessarily be directly connected to the clock, to fully contemplate the idea. 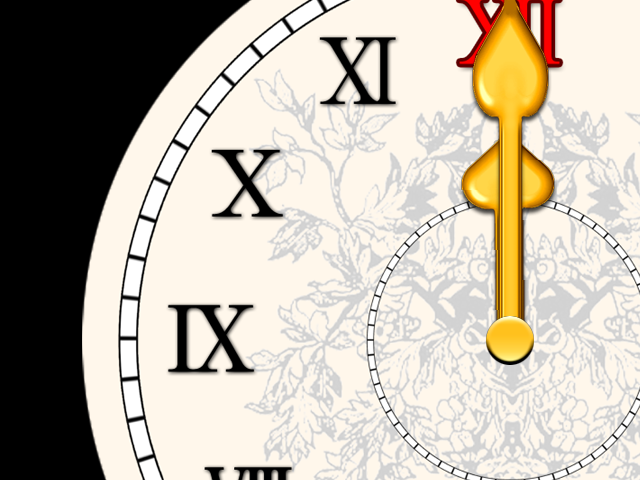 Nevertheless, we come back to the fact that there’re neither markings such as On/Off on the clock and nor sounds produced by the clock when it is flipped to the right of left to activate or shut it down. This means that even in an impossible coincidence the culprit would still not find the clock to be that suspicious other than being momentarily puzzled by the reason why an old clock being there in the first place. My reasoning for this is that the massive amount of Gold serves as a perfect distraction which I gather is a trick to make the whoever finds the gold to not focus on the clock. For the aforementioned reasons unless properly explained, it’s debatable for anyone to bother with a simple clock. Even if they were the chances of fully knowing its purpose and how it functions are extremely limited. Lastly, Yasu’s explanation that the device was fully working gave the culprits in EP7 the certainty that it would work without doubt. Without any of that info the culprit noticing the clock and finding its full usefulness is terribly arguable. There simply must exists a person to explain of all these details. By this I claim that a person who knows of the device must explain the device to the “new culprit”. Only a person who knows of the device can properly set it up. Anything else would be an error in the culprit’s plan, for example, it was an accident on his part. It’s possible but still unlikely the culprit would foolishly mess with an old clock when the culprit has found the gold. The culprit would have other priorities, I stress that part. In the case it was a mistake – the culprit didn’t set up the bomb. It wasn’t his intention, it was somebody else’s. The culprit decides to carry out the epitaph for his own reasons, proceeds to kill everyone. At some point Yasu or someone who knows of the bomb existence flips the switch. The culprit continues to murder everyone even near 24:00 pm of October 5. The culprit doesn’t suspect a thing because the culprit never found Yasu or found the gold. The culprit had some other motive to kill everyone. Yasu had the same idea as the other culprit but since the culprit has already carried out most murders she only heads to the secret room and set up the device. The culprit is killed along with the survivors because of the bomb. None is left alive as a result. Yasu’s plan only changes because there’s somebody else doing her job. Because she doesn’t want anyone to leave the island alive she sets up the bomb which ultimately kills everyone. This is why when the gold is never found it also means the other culprit (not Yasu) never knew of the existence of the bomb, therefore the culprit never put it in his plans and the bomb goes off anyhow and the new culprit dies along with the others. Also in the case the new culprit wasn’t done killing everyone by 24:00 it means the killer failed and he was taken out with the very bomb he set up in the scenario where the new culprit meets Yasu. It’s the same if the new culprit didn’t know about it because he never solved the riddle. In EP2 if we assume Rosa is the culprit then she never had the time to escape the explosion therefore why she tries to make it to the sea but never makes it. Assuming she wasn’t the culprit it means the one who did know of the bomb set it up because the gold was never found in the first place or that this person set it up before she even did. The result is the same the bomb still has to go off therefore why Rosa and Maria are killed. It works both ways, in one it assumes the culprit panicked, didn’t know that info, or never had the time to escape and in the other it works under the assumption the one who knew of the bomb flipped the switch on the rest out of vengeance or because the riddle was never properly solved. In the case the killer is someone else other than Yasu (Yasu is present) -Then this person would’ve had to be informed of the existence of the bomb in the first place and how it works. The riddle is solved (likely by the Siblings) EP7 shows a scenario in which the Gold is found and the original culprit (Yasu) is defeated , she tells them of everything they need to know now that she’s had lost. The team work goes to hell when an accident happens and they get greedy, leading to the tragedy. Now that they’ve found the gold (rather the cash card) the culprit has a motive to kill. The survivor of this massacre after finding the underground VIP room is likely the culprit. The new culprit takes the place of the “witch” and carries out the serial murders one by one while pretending to be innocent. At this point Yasu, now that her role was over, should have been killed by the new culprit so one learns of the latest events. Also Yasu should have given up on ceremony because the epitaph had been solved. Going against it would be a violation of the contract, therefore the killer for the following murders should be the “new culprit” and not Yasu. The new culprit’s objective is to kill everyone and make the evidence be destroyed using the bomb along with faking his death to the eyes of the police. Elaborating on this. The culprit learns of the bomb, kills Yasu, decides to kill everyone after getting that cash card in the case his motive was greed. The culprit forgets about the gold and wants the mansion to blow up with all evidence. He sets up the first twilight. The culprit can do the same as Yasu and either kill 5 or fake his death and hope no one finds out he’s faking his death so there are six bodies. This new culprit could use an accomplice but let’s assume he doesn’t for the sake of it. The culprit found the gold by himself (or with his partner) and decided to murder everyone. It would go like this: the killer kills 6 people and sets up the 1st twilight, the culprit soon returns to his room (mansion/guesthouse) after he’s done. By the theory that the culprit didn’t fake his death in the 1st Twilight the culprit will need 6 bodies for this. He kills everyone at the family conference or somewhere nearby (which explains why there’s so many Ushiromiya corpses) and addition to the servants who were on duty at the mansion. This can be seen in EP1, EP2, EP4. Mind you, this does go against the belief in EP3 it was the first time the gold was found, but that’s debatable. After he killed them he moves the bodies to what would become the 1st Twilight in those games. By the idea that a group found the gold and the culprit was the only survivor either because of an unfortunate massacre or because he killed them, it means those people were used to create the 1st twilight by the culprit. The 1st Twilight it formed by “six” sacrifices therefore the culprit would only had to kill one more person to comply with the requirements. The culprit looks for this person in the mansion after he mysteriously disappeared with the first 5 or the culprit calls the soon to be sacrifice to come over from the guesthouse to the mansion. He kills the servant (we assume all Ushiromiya never left the mansion) in the garden where he rain washes the evidence away or ambushes the last sacrifice at the mansion hence why the blood stains. In case there are multiple culprits then in case there’re are two culprits working together then they’ll need to get 2 more bodies for the 1st twilight. These two can be gotten in the same fashion either by calling them or making sure they were there in the first place – EP4 why there were more servants present on that family conference than usual. The new culprit can use any methods. Setting up the bomb prematurely it’ll mean that he could also get caught in the explosion in case he doesn’t make it by that time, but it would also mean that there would be no survivors even if he failed. This would be actually more beneficial because no one would ever learn of what happened on that day anyway. The culprit sets up the bomb that it could either be set up prematurely or not. In case he was killed by one of the survivors the bomb would take care of everything since no person who didn’t know of the bomb existence would have a reason to leave the premises until it was the morning when the boat actually came. By this foolproof method it explains why there are always no survivors in Rokkenjima even if the killer was killed in one of the twilights as the bomb is set to go off at 24:00. In the case the culprit is successful in carrying out all the murders the culprit would only have to go back to the secret room and flipped the switch after he was sure there was no one left alive. The bomb would erase all evidence and the culprit would be believed have followed the same fate as those who were murdered. EP1 – Yasu carries out most of the serial murders because the riddle is never solved. Flips the switch at the 9th twilight, prematurely, or an accomplice does it. Dies with everyone at 24:00. EP2 – The culprit panics and never makes it. The culprit dies along with everyone because of the bomb, therefore it’s possible the culprit lacked some info from the start, this wasn’t part of the plan or miscalculated. Yasu’s position and original involvement is debatable due to the gold being found or not. Possible additional foul play in this game. EP3 – EP7’s Tea Party. Yasu is killed. Eva as the culprit is self-explanatory. Second theory The bomb is set up by the Eva or by the culprit, however, Eva isn’t the culprit but the one who actually killed everyone on the island is instead. The bomb covers everything up. EP4 – The culprit prematurely sets up the device and gets killed later. 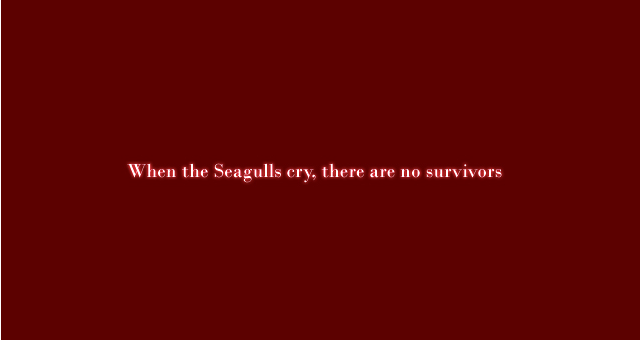 This explains why Battler is killed despite being the only one alive left. The bomb kills him. EP5 – The riddle is solved. Yasu should’ve stopped. It’s possible Yasu had a change of heart or the new culprit somehow learns of the bomb. Nothing can be sure because the game is put on hold for all eternity. We assume it has the same ending, the bomb kills everyone. EP6 – The riddle is never solved, therefore the bomb. No one reaches the secret room. EP7 – Tea Party’s explanation. That is why the bomb always goes off. 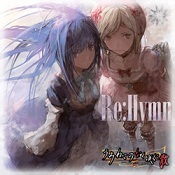 This entry was posted in Reasoning and tagged Beatrice, bomb, EP1-EP7, Kannon, Shannon, theory, umineko, Umineko no naku koro ni, Ushiromiya Eva, Ushiromiya Kinzo, Ushiromiya Rosa, Yasu. Bookmark the permalink. The description you were looking for of the bomb was that Beatrice claims an expert judged it would make a crater several dozen metres deep and a kilometre across. The mansion, guesthouse, chapel and a wide enough area around them that only someone specifically running away from the bomb/murderer might be outside it should be destroyed. I would also assume that Yasu would take the first opportunity after midnight on the 4th to flip the switch, since she has no particular reason not to. If she dies and the epitaph wasn’t solved, the bomb explodes as intended. If she dies and the epitaph is solved, the first thing someone sees on finding the gold is a letter explaining about the bomb and how to turn it off. There is an additional possibility for the bomb exploding that you missed as well – in Episode 7, Eva became convinced that Yasu was lying about which direction was armed and which was disarmed. Without the demonstration of actually meeting Yasu there just before midnight on the 4th, it would be very easy to believe that someone who found the letter afterwards, or even some or all of the whole group meeting her if they arrived slightly after midnight when it was too late to make such a demonstration, might believe the description of the bomb to be a fake to make them kill themselves if they defeated Yasu. It seems quite possible that someone with that knowledge still alive at the end might decide to make sure the bomb was armed while thinking they were disarming it. I would in particular consider Eva as possibly having done this in Episode 3, with moving to Kuwadorian being a precaution in case she was mistaken (I don’t consider Eva the culprit, so I don’t believe she needs the coverup), though Rosa in Episode 2 could also be possible, especially as it seems much less sensible for her to have the bomb armed early. I disagree on the new culprit being responsible for Episode 4. 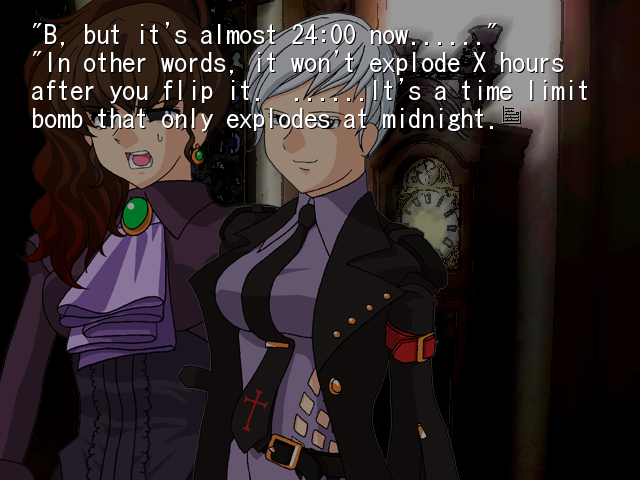 Battler speaks to Beatrice very shortly before discovering most of the bodies, and she appears again on the stairs at midnight on the 5th as the bomb is set to explode, all of which suggests she was the one who armed the bomb that time (at the very least, she didn’t decide to disarm it). EP7’s idea that Yasu must be present at the very moment they reach the golden land is debatable. A letter would work better in addition to the fact that Yasu isn’t revealing her full identity. There are other points to that that I’ll mention. Assuming Yasu is a servant it’d mean she’s on duty either at the mansion or at the guesthouse. She relies on alibis for all the amount of X hours she’s away (which can be covered by another person) and she’s probably going back to the secret VIP room. Leaving and entering is a bad idea for Yasu for the reasons that there could be someone who could followed her (like Rosa possibly did in EP3) and find out of the place without solving the riddle. In this case a letter is the better plan for secrecy. Another point with Yasu not being present is that there’s an issue with Yasu actually finding out someone the gold in case they keep quiet. Yasu is only defeated when she is either killed or someone solves the riddle according to EP7. Yasu can only guess this person did if he doesn’t (and never) proclaim it. In EP5 this fact is evident but not in all games. A possible explanation of how Yasu would know, it’s that the killings have started and it isn’t her doing meaning a new culprit. Yasu should give up in case she believes this person solved the riddle, though I don’t believe all of that. I can only trust her word assuming Yasu takes on part in said EPs. Now going for the letter theory it’d be similarly possible and not all jumping to conclusions that inside the envelope there’s also cash card inside it (motive), which would be better than converting the gold for cash because it’d a total hassle for anyone without connections as we’ve seen in EP7 and someone such as Krauss is needed. Lastly explaining how the head and everyone else died while the survivor comes across a large amount of gold is suspicious. The cash card is hundred times better. Rosa’s thinking is “naive” thus she might have believed she could do something with the gold herself in EP2. She is killed in an “accident’ either by miscalculation on her part rr by somebody else who also knew of the device. Of course, a similar mistake where Eva freaks out and almost kills everyone can easily happen in other Eps as you mentioned. For the sake of debating the existence of a letter instead of an actual person I mention the following points. I mention that in EP3 and EP5 no one meets Yasu. Going by EP5 when Battler and Erika reach the gold land they find neither Yasu nor a letter of the sort which by the letter theory there should be one. When they go back and fetch the siblings no one finds a letter which I assume should be in a visible place. Battler finding the gold should mean that Yasu gives up on following the epitaph. Why the bomb still goes off (we assume it always does) must then be attributed to somebody else learning of it. To explain that event that strange occurrence I mention since I’m proposing it myself EP5 Battler’s POV, some siblings got it, or Erika might’ve grabbed it before anyone noticed it. She’s the only one not startled by the gold anyhow which raises the possibility. Erasing the letter from that EP must indicate the culprit for that EP manages to learn of the bomb by some method and at some point goes back to the underground passage to activate it. EP3 can work either way. In my opinion, there could be games where Yasu is present at the Golden Land and in others simply a letter. Lastly, there’s also an issue whether Yasu would keep her promise or not, which she could or not. According to the epitaph she should keep it under normal conditions, however this is never guaranteed. We can only trust her word. In other words when the bomb isn’t her doing and she hasn’t had a “change of heart” it means that most likely it was a mistake, the new culprit or somebody else who learned of the bomb did it either by Yasu herself, overheard it, or already knew it of from the letter. Lastly, of course as mentioned I see no reason for neither Yasu nor the new culprit to not set the bomb prematurely other than being slightly more fairer in this game (Yasu) or thinking of his own safety (new culprit) Having a plan B is nice for both of them in case they failed in the process so the truth is never found. Yes, I agree with that, just in case it wasn’t clear. In fact, I would guess that the ceremony appointing Eva as the new Beatrice in Episode 3 represents meeting Beatrice at the gold and receiving all the instructions on the role of Beatrice, whether in the real story that was Eva on her own or the whole group meeting her the previous night. I believe she would… but I would wonder whether Shannon and Kanon would consider themselves bound to her promise or whether only the Beatrice personality would be. There was a bunch of stuff in Episode 7 about how a personality could “die” while leaving the other personalities alive. 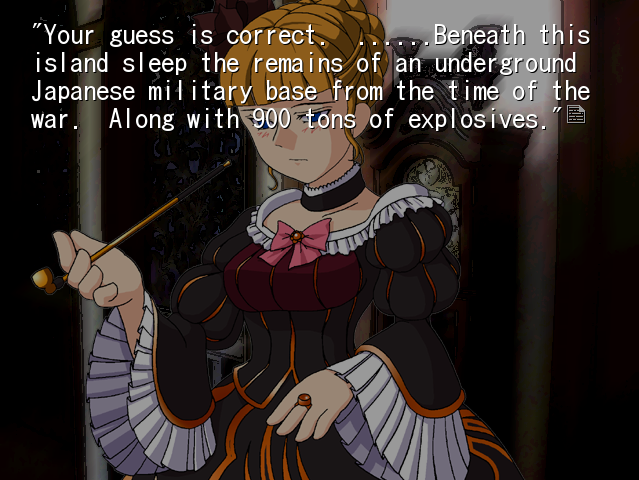 I think it would be possible for Shannon or Kanon to carry on with their own goals after the gold is found and Beatrice “dies”, provided they haven’t died themselves, and I would assume that they know of the bomb too. in ep1-ep4 the epitapt is solve by the parents.beato inform them about the bomb and they disarm it.so it explain why they made it till the next day. the culprit must the one of the parents who solve the epitapt. I like how you just made your own reds that aren’t technically in the story. Real professional. I like how you try to sound confronting and witty instead only come off as whinny and being challenged in the reading and comprehension department. Not only you fail to get the point of any entry you glorify the idea you believe yourself to be right while giving minimal explanation. Even more when I’ve already explained the said points. Lovely. Let’s analyze that, okay? First you opened your internet and magically came this place. Bam. You soon found the content to be disagreeable with you. What to do? You *have* to do something about it. You proceed to skim through a few posts. “I still don’t like this” – you think. Must do something NOW. You write whatever you found to be disagreeable and focus on that while missing the whole point of the entry. Extra points for being 1st rate on this one. Ok, you’ve made a point. Now you want to move on to the next paragraph because you’ve clearly not read the whole thing. In case you did, your mind did not register everything. You finish typing and posting what’s on your mind before it even did. A solid line of reasoning is thus created. The rundown of your posts consist of the following. The richness of both of them is abysmal by now, I assure everyone. A) Under the guise of making a different point you claim whatever you especially dislike as your strongest point. B) You keep it simple, thus showing you don’t really need to explain your flawless claims. C) The contents of your replies both contain negativity and pure lack of constructiveness. Why remotely bother with anything else when you can jump to conclusion? More bonus points for that. D) You have a problem with the red thus look for it in posts. We’ll stress the fact you don’t understand the idea that they’re used to handle certain scenarios in which a fictional red is used to restrict the number of theories. In addition the fact you can’t distinguish between personal thoughts and theories is almost frightening. E) Your lack of constructiveness makes you unintelligible and barely worthwhile other than for simple comedic purposes, which by choosing your words better and expanding more on what you believe in you could’ve accomplished a lot more. F) Now there’s finally the contradictory nature of hanging around a place you don’t enjoy because you want to. But it’s not about that, it’s about wanting to be right with minimal effort. You’re only missing CAPS to make your points stronger. G) Lastly by now you believe yourself to be right under the premises you’ve created and periodically or right away you look forward repeating the same process in the future with full enthusiasm. Too bad it won’t come. You’ve both proven to be unconstructive with little to provide to the readers, myself or the mystery and with few redeeming qualities based on your comments. I’ll take the mental strain that it produces you to stay around here by not being welcomed anymore, which you could’ve easily avoided by trying to be slightly more constructive. You can thank me for that and for the following. Consider getting a hobby if not a new one, eat healthy, buy yourself a present, work on your tan in summer, get a dog, get a cat. On that note, maybe not Bernkastel’s. They aren’t that nice. Don’t worry. Even if you don’t appreciate what’s done here, there are others who do and who will. other peoples interpretation is important so don’t disregard them as false or fake just because they are not explain in the story. please grow up and don’t be immature in this kind of things. yasu’s accomplices are maria and genji but she does all murders. There is a solution. "The journey is now over until something else cries again."